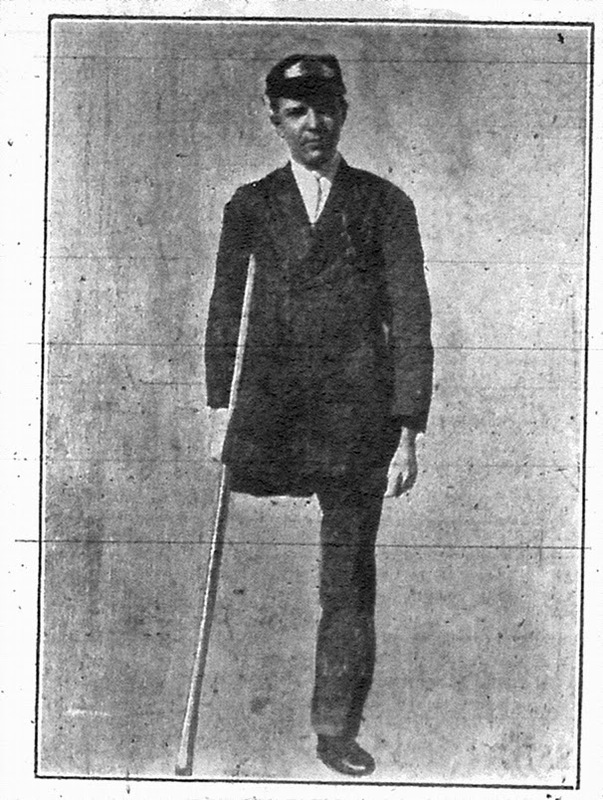 Too bad Robert Ripley wasn't drawing his famous cartoon series in 1911; he would have loved the story of Harold Casey, dubbed by the Press Democrat as the "crippled messenger boy." 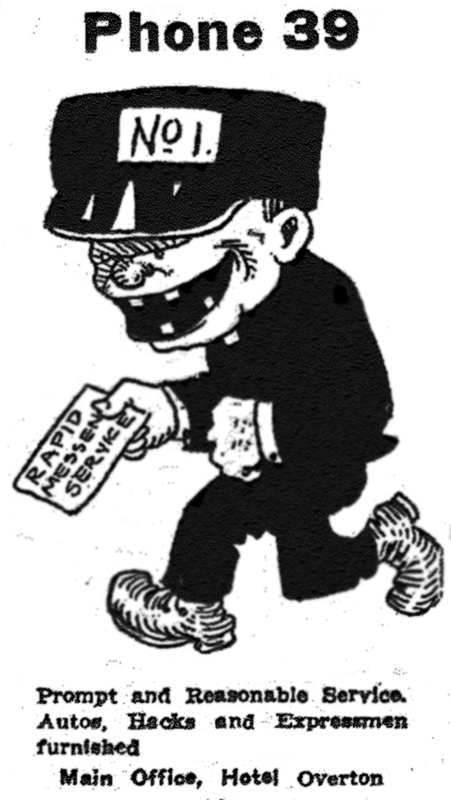 Readers of this blog were introduced last year to the "Rapid Messenger Service" and its odd little ad seen here (why the running character looks angry or demented was never explained). 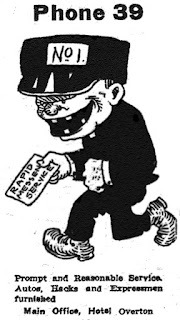 That earlier item also reproduced a funny comic strip that appeared only once and showed a bicycling messenger racing between Santa Rosa and Petaluma at rocket speed. Here's the Believe-it-or-Not! twist: Messenger boy Harold Casey only had one leg. Harold's right leg had been amputated just below the hip when he was nine, the result of a pair of usually routine accidents. He used crutches. He was certainly a plucky young fellow to take such a job, and fie on the local newspapers for not telling us more about him and how he coped with his handicap in 1911 Santa Rosa. Bicycles were the main type of speedy transportation in those days and he certainly could have used a bike with some sort of handbrake installed. But we only know about 16 year-old Harold Casey at all because of an unusual benefit held to raise funds for a prosthetic leg. "The performance this evening for Casey's benefit is intended and expected to 'fix him up' as good as new," the Press Democrat said. "Everybody is invited to attend. There has never been anywhere an entertainment and charity ball for a purpose more worthy." Among the entertainers were "Tom Pierpont, the human canary," "Hoey and Lee, Hebrew impersonators" (um...), and "Jack Mathews will also be on hand with a mysterious stunt which he refused to talk about." As the previous item revealed, barkeep Jack liked to dress up and warble minstrel show tunes while wearing blackface, so perhaps it's best he kept mum about his "mysterious stunt." Hopefully a grand time was had by all and Mr. Casey collected enough money for a good quality leg to make his job easier. The messenger service appears to have closed about a year later and while one of the articles below states he was attending school, there's no record he graduated from Santa Rosa High. His trail disappears after the benefit dance although it's likely he is the same Harold H. Casey who can be spotted in the 1920 and 1930 census working as an elevator operator, first in Portland and later in San Francisco. Everybody is going, or ought to go, to Harold Casey's benefit entertainment and ball at the rink tonight. This affair has been arranged to help the crippled messenger boy to stand on two feet again, to buy him an artificial leg [illegible microfilm] as well as may be the limb that was amputated when the lad was nine years old. He is now 16, and has so nearly attained his growth that the makers give assurance and guarantee that the leg made to fit him now can be adjusted as he grows heavier, and that it will last him to the end of his days. Harold is a native of Santa Rosa. While living at Windsor, and when three years old, he sustained a wound in his right knee which became infected. Blood poisoning followed, and the leg did not fully heal. When he was nine the same leg was broken and amputation became necessary. Since then the boy has gone on crutches, attending school and working to earn his living as best he could. Part of this time he has been with the Messenger Service, and after today he will become proprietor, the business having been donated to him by W. Clay Silver, for whom the boy has worked for the last eight months. The performance this evening for Casey's benefit is intended and expected to "fix him up" as good as new. Everybody is invited to attend. There has never been anywhere an entertainment and charity ball for a purpose more worthy. The program offered will be one of the best of the kind that has been presented in this city. Among those who will participate are the Rose City Quartette. Hoey and Lee, Hebrew impersonators; Tom Pierpont, the human canary; Professor Madison, magician; Dan Leno, cartoonist of the Bulletin, and Frank Greene, Jr., the local sketch artist, who will make life-sized drawings and cartoons of well-known Santa Rosans. As an additional attraction the management has secured a Moonlight machine and the dancers will glide 'neath the silvery light of the calcium moon. Mrs. Berry's orchestra will render several selections at the opening of the performance and play for the dancing afterwards. The committee of arrangements have announced a good program, a fine floor and excellent music. Nuf Sed. ...The first part of the evening will be devoted to a vaudeville performance, and some splendid stunts will be given, and following that the floor will be cleared and dancing will ensue until midnight. Dan Leno, the Bulletin's famous cartoonist, came up from San Francisco on the 1:15 train to participate in the evening's fun. Jack Mathews will also be on hand with a mysterious stunt which he refused to talk about. A big surprise is expected when Jack appears. A moonlight dance has been arranged by the management as an addition attraction.